Unless you are visually-impaired, you probably use your eyes every waking moment. Ironically, you probably only take in a small portion of what you see. That's perfectly reasonable, though; truly, it's rare that any one person could accurately remember every detail of every experience he or she undergoes. Yet as a creative author, you'll be expected to describe scenarios and events with interest and detail. Even a small visual item that has been neglected could break the flow of your next novel, play, or poem. One good way to ensure that your written works are filled with visual interest is to ask for open, honest feedback from friends, family, or, if applicable, editors and agents. Find out what those individuals wish you'd specify in terms of visual elements. Then, weave their constructive suggestions into your piece. Sit silently for the next minute. What did you hear? Chances are, you discovered that there is an orchestra of sound going on around you, but your brain tunes out most of those noises for the same reason it doesn't register every sight you see. Unless you're writing for the stage, radio, or television, you'll have to be the "ears" for your readers. This translates into using ultra-descriptive terms to precisely express the way something sounds. For example, did that bird outside of your window just chirp? Peep? Peck? Caw? The adjective, adverbs and verbs you use will all have a specific, unique impact on your writings. Though figuring out the best word to use can sometimes seem a tad maddening, it's critical that you stretch yourself as a writer. Your readership will thank you later. Finally, we get to the sense most closely connected to memory. Even more than taste, smells have a direct route to that area in our minds that closely guards our experiences. Perhaps it's a throwback to our Neanderthal/prehistoric days, when we must surely have sniffed into the wind to glean whether an animal or storm was coming our way. Or maybe it's just "one of those things" that will be debated until the end of time. Regardless, it's a scientific fact that you need to keep in mind as a creative writer. To specifically describe an odour, you must get honest with yourself. Often, we want smells to be cut and dry; but as any wine connoisseur knows, they can be quite complex. For instance, if you have a character who is walking along the riverbank, there are likely to be many different aromas assaulting his or her nose. First, there could be the water itself, fresh and clean-smelling or offensively polluted and reeking of sewage. Next, the wildlife could be emanating a variety of smells, including that of a peculiar musk, rotting fish, or even foul-scented breath. Finally, the surrounding plants might add an air of perfume to the mixture. 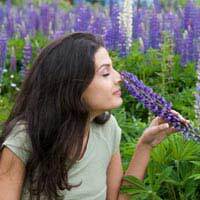 Your role as a writer will be to cull exactly which scents impact the character; subsequently, you can focus on only those few smells. Essentially, you must walk with your character, smelling what he or she does and relating it in a truthful, eloquent manner. There are really no fixed rules to follow when it comes to describing the senses. Use your imagination and feel free to play with words and images. Just make sure that your focus on your work's sights, sounds and smells don't detract from the storyline, theme, believability, or consistency of the piece.